Bride of FRANCINSTIEN (BoF) is is a refinement of the original FRANCINSTIEN algorithm which was launched during the 1990s. The crosstalk parameters in the BoF which are described below. For the most recent version of FRANCINSTIEN (the 3rd generation T-Sym process, go here). Here is a technical article on the Bride of FRANCINSTIEN process. Technical information on the FRANCINSTIEN T-Sym process is given here. The overall point is simply made. For a given channel intensity difference, the HF components of an instrumental or vocal contribution will subtend a greater angle at the listening position than will the LF components. We can illustrate the effect of the Shuffler and the original FRANCINSTIEN circuit by substituting the corrected values into the same model. The results are given below. The curves demonstrate the benefits over untreated signals; especially in the all-important central region of the stereo image. However, following in EMI's footsteps, the original FRANCINSTIEN actually over-compensated the HF image; causing it to fall inside the LF image at the extreme image positions. Is it possible to engineer a frequency-dependent channel-intensity modification so as to bring the two models closer and effect a better match for the LF and HF image? Which illustrates that an almost perfect match is obtained. For all support issues, go here. © Pspatial Audio 2015 - 2019. All rights reserved. Apple Certified Developer. 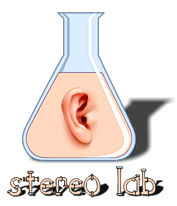 Stereo Lab, Aria 51, Aria 20, Head Space, Groove Sleuth, iLOOP and FRANCINSTIEN T-Sym are trademarks of Pspatial Audio. FRANCINSTIEN and Bride of FRANCINSTIEN (BoF) are trademarks of Phaedrus Audio. Macintosh and the Mac logo are trademarks of Apple Computer, Inc.